Former deputy finance minister Terence Mukupe. Former Deputy Minister of Finance and Economic Planning Terrence Mukupe has hinted that something fishy could be cooking in the corridors of power after making a sensational claim that the 72 hours will be crucial in shaping the new direction the country will take post violent protests that rocked the country early last week. 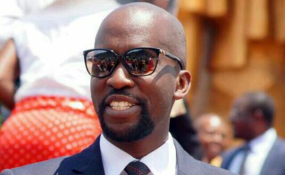 Mukupe who later tweeted that he had skipped the country into Mozambique together with his family is a close ally of President Emmerson Mnangagwa. "I'm worried with whats going on... The citizens are blind to whats really going on... The next 72 hours are going to be crucial regarding the path we are going to take as a nation... Chokwadi chichabuda... President Mnangagwa is not the issue... Viva Zimbabwe," tweeted Mukupe. Later on Mukupe tweeted rallying the nation to pray for Mnangagwa saying, "Lets continue praying for our President EDM... Takuda kuita go back to sender!!!." With many rumors of clandestine meetings at vice President Chiwenga's farm, Zimbabweans are living in fear of another military coup and dethroning of Mnangagwa to be replaced by his deputy, Constantino Chiwenga. According to ZimLive, war veterans leader, Christopher Mutsvangwa is reportedly leading revolt against Mnangagwa and is said to be rallying Zanu PF members of parliament to impeach the President upon his return from his five-nation visit that took him to Russia, Belarus, Khazakstan and two others.